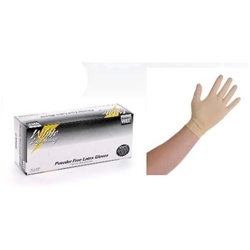 White Lightning X-Large White Nitrile Gloves BOWES GL WHITE XL Box of 50. Extra thick 8 mil glove! Provides superior protection against chemicals and hazards. • Reduced Latex Protein! Additionally processed to remove extra latex proteins from the glove, which may reduce risk of latex allergies.